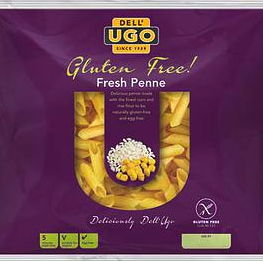 Dell’Ugo is a UK pasta brand that has been in existence since 1929, and now has a gluten free offering. The main thing that makes Dell’Ugo stand out from the crowd is that their pasta is fresh, along with the unique chickpea fusilli. I have to admit, I had not heard of this brand until I was sent samples of their penne and chickpea fusilli, but I was particularly keen to try the chickpea pasta as it is something I had never seen before. The pastas are hand made and fresh, so they need to be refrigerated, or they can be frozen (and cooked from frozen – just add an extra 1 minute to the cooking time). 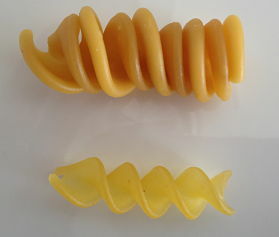 The low GI chickpea fusilli won the 2013 Free From Foods Innovation award. The first thing you notice about it is the size – it is much larger than a standard size fusilli and it does expand slightly with cooking. 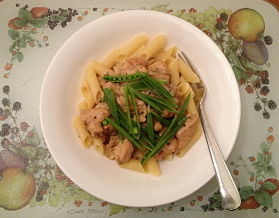 The pasta held together well after cooking (4-5 mins) and I really enjoyed the taste – it is slightly nutty but the chickpea taste is not overpowering, even though it made of just chickpea flour and water. I think you may even be able to trick youngsters into getting their fibre if you have a tasty sauce! 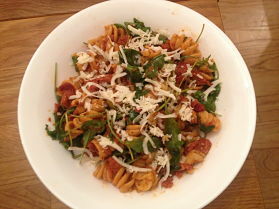 I whipped up a sauce just using things I had in the fridge – a red pesto, chorizo pieces and rocket, along with some grated cheese on top. I wasn’t sure if cheese would taste right with chickpeas, but the meal felt like a traditional pasta dish. You can find some other recipe suggestions here. The penne is obviously a more traditional pasta and it compared very well to the dry pastas I would usually buy. It cooked in 4-5 minutes and it tasted similar to what I am used to, just fresher! It is made of cornflour, rice flour and water. I will definitely buy these pastas again as the taste is great and both are a lot lower in calories than the dried pasta I usually buy. The chickpea fusilli is higher in protein and lower in carbohydrate than other pastas, and there is a whopping three times as much fibre. 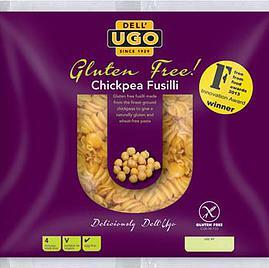 Dell’Ugo gluten free pastas are 300g per bag, which will serve three people (or two with large appetites!). They are egg free and suitable for vegans. The fresh pasta has a fridge life of around one month and once opened needs to be consumed within 48 hours. If frozen, it can be kept for 3 months. It is available exclusively in the UK from Ocado, Waitrose, and WholeFoods Market with a RRP of £1.79. If this post has been useful to you, please share using the buttons below! If you enjoy pasta, you may also like my review of gluten free gnocchi.